Fabulous Art room in AVP!!! As we believe that every student is unique in his own way, the most important task is to discover and identify the God given talent to be developed as masterminds. For this purpose, we have experts and renowned masters of their various fields. They provide regular training in advanced arts, music, drama, sports, games and skating etc. The school has well trained and efficient teachers/Instructors for Karate, Skating, Music, Art and Craft Football and Basket ball etc. ATMIYA VIDYAPEETH ART & CRAFT GALLERY. The art Gallery of is the work of mastermind in art and craft. The beauty is certainly in the presentation of creative works but we not only exhibit the art work of dexterity but enable the students to enhance their in - born talent of art and craft to make their artistic works a part of our art galley for which they can be proud of. It is a matter of great joy not to our students but also to their parents to look at the artistic works of their children as and when they visit our school premises. Art and Craft encourage students to develop a variety of interests. Students are presented with opportunities to explore, plan and create in the areas of painting, printing, drawing, collage, modeling, sculpture, clay, textiles and digital media. The AVP School Art room is a place where students can develop their self-esteem through involvement in the art making process, having fun as they explore new ideas, materials and techniques. 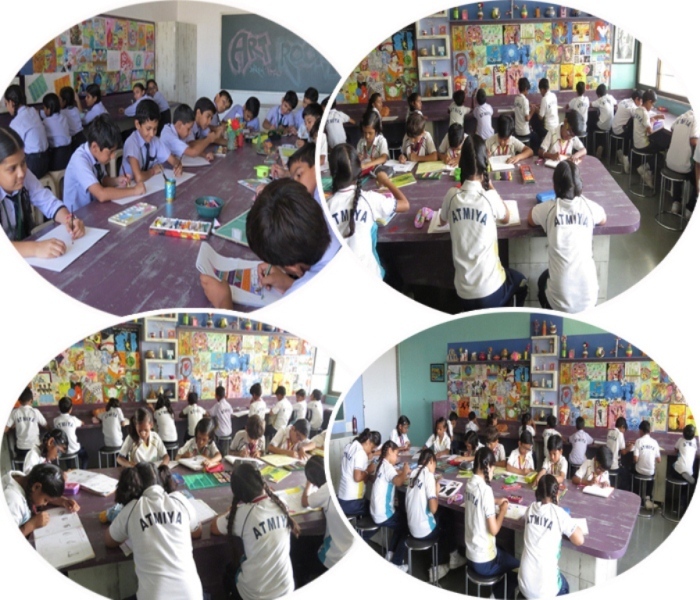 The Art room is a well-equipped, spacious, light-filled space that is visually engaging for the students. The Art Room facilities offer wet and dry working areas and ample storage of artworks. Assessment and reporting are on an individual basis with individual student goals set to progress students along the continuum of visual arts skills. The Visual Arts program is ‘strength’ based which focuses on using acquired skills as a starting point, boosting their self-confidence.